Traditional Islam 101 report: Slave girls in Islamic State went for little as $500 dollars……. – The Tundra Tabloids……. Traditional Islam 101 report: Slave girls in Islamic State went for little as $500 dollars……. The Jihadist organization has been engaged in a large slave trade. 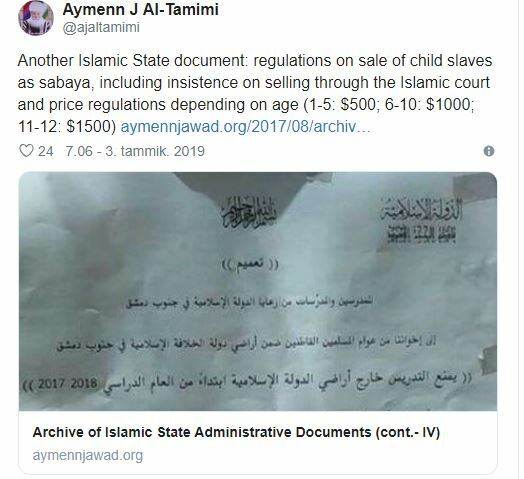 Aymenn Jawad Al-Tamimi, a Middle East conflict expert who publishes ISIS jihadist information and Documents online has uploaded new ISIS papers to his website. 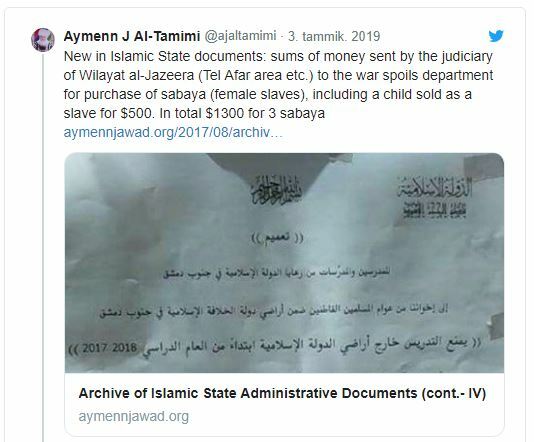 Among the material found in this link are documents that details of the slave trade by jihadists. For example, a document makes provision for girls to be sold as slaves only through an Islamic court. The prices quoted by ISIS are by age group and are also recorded in the document. A 1-5 year-old girl is worth $ 500, 6-10 up to $ 1,000 and $ 11-12 to $ 1,500. 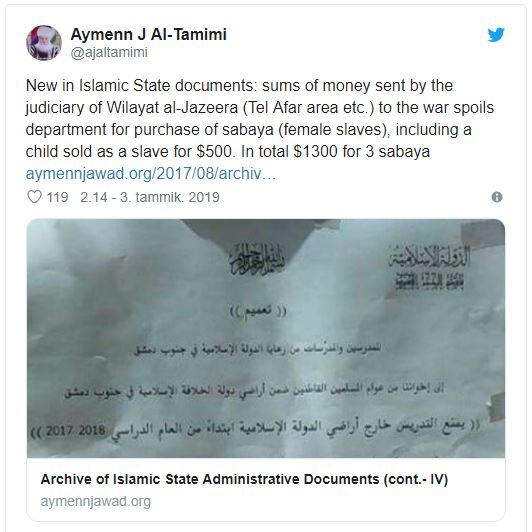 The second paper includes a record of funds from the slave trade to a “war” arm of the ISIS legal administration of the Tal Afar region of Iraq. The paper includes a girl sold for $ 500. A total of $ 1,300 was paid for the three mentioned slaves. They were all women or girls. ISIS is known to have engaged in large-scale slave trade in the areas it captures. For example, women belonging to the Jesuit minority have been forced into sexual slavery and systematically raped. Iraqi Jesuit Nadia Murad , who fled from ISIS slavery in 2014, received the Nobel Peace Prize in November for her anti-trafficking activism. Previous Post Previous Post Dr.Manfred Gerstenfeld: Chancellor Merkel’s Legacy And The Jews……. Next Post Next Post Islamic supremacism: Grand Mufti of J’Lem says “whoever is disturbed by call to prayer can leave, they’re foreigners”…….